NACOGDOCHES, Texas - Concert pianist Kevin Ayesh will perform at Stephen F. Austin State University at 7:30 p.m. Saturday, Oct. 13, in Cole Concert Hall as part of the SFA Friends of Music Concert Series. Ayesh, who has presented concerts and master classes throughout the United States as well as in Canada, Belgium, Germany, Sweden, Switzerland and Hong Kong, will present a varied program featuring the music of Ludwig van Beethoven, Johannes Brahms, Gabriel Fauré and Frédéric Chopin. Among the works on the program are Beethoven's popular Sonata in C Minor, Op. 13 (the "Pathetique"), Chopin's majestic late Sonata in B Minor, Op. 58, and some lesser known "caprices" by Viennese-born American composer Robert Starer, who was a faculty member at the Juilliard School from 1949-1974. Ayesh has taught music at Blue Ridge Community College in Flat Rock, North Carolina, since 1992. As a North Carolina visiting artist for four years, he appeared before thousands across that state, performing as many as 50 recitals in a season. He is a recipient of the Naftzger Piano Award and Baltimore Music Club Award and winner of both the JCC Baltimore Piano Competition and the Maryland State Music Teachers' Elizabeth R. Davis Memorial Piano Competition. Ayesh was awarded second prize at the Wideman International Piano Competition and won both third prize and composer's prize at the New Orleans International Piano Competition. This past summer, Ayesh was a guest artist at the Lindlar International Piano Festival in Germany, and he has recently served as a recitalist and clinician for the Gene Marcus Piano Festival at Purdue University-Fort Wayne in Indiana, the Star Valley Junior Music Festival in Wyoming, and the USA Piano Camp at the University of South Alabama. 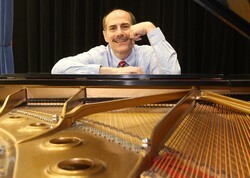 According to Dr. Andrew Parr, professor of piano at SFA, Ayesh will present a master class for SFA student pianists in Cole Concert Hall at 10:30 a.m. the same day as the concert. The class is open to the public and free of charge.